Lunch is a special meal. For those with a traditional lunch hour, the goals of lunch are usually to find something wholesome and not overly unhealthy. With quick bites and a philosophy of ownership in the finished product, Assembli has recently sprouted up in Vancouver's busy Cambie Street corridor. Do the custom eats here keep up with the hustle of a busy lunch hour? Disclosure: This was a complimentary media tasting. All opinions are my own. You'll notice that everything above is the same price, and that seems to be a staple of most food items at Assembli. 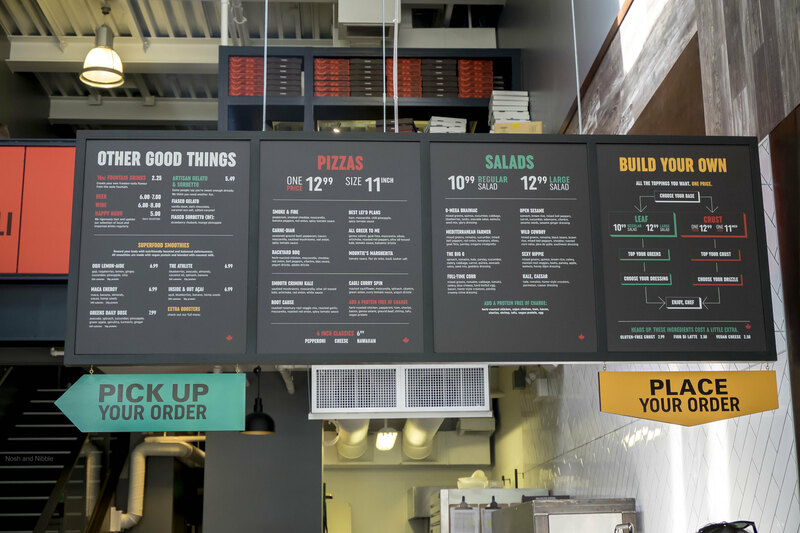 To save on the fuss of quick bite counters where prices are measured by number of items or by weight, you can customize your own pizza or salad for a staple meal price of $13. If customization isn't your thing, the menu has some named combinations ready for your perusal. As you might see, a ton of ingredients are available for the picking. From pepperoni, to goat feta, kale, adobo drizzle, a variety of toppings, sauces, and drizzles are available for your pizzas. Same goes for the salads. The Wild Cowboy Salad contains greens, romaine, black beans, brown rice, bell peppers, cheddar, corn salsa, pico de gallo, and southwest dressing. I found the Wild Cowboy Salad to have a great mix of flavour thanks to the zesty southwest sauce and a dose of wholesome carbs with the brown rice. My main interest were the pizzas. I personally love the flexibility of sharing my custom pizza or keeping it all for myself. I can be greedy. The pizzas here all had a chewy dough with a deliberate charring on the crust. Some diners might find the dough too blackened so for those with a low char tolerance I'd recommend requesting this at the time of order. It is, after all, a custom-made pizza. My favourite was the custom-made Carne Pizza. With a healthy dose of bacon, pepperoni, beef, mushroom, and red onions, this was a hearty dose of pizza with just the right amount of charring. If I could make one adjustment to the pizzas, it would be to have an option to add more sauce. I'm in a cohort that loves tomato sauce underneath the cheese. I don't think I'm alone. Nevertheless, custom-made pizzas is a novel addition to Cambie Street. The philosophy of a hearty fresh meal is a great feeling to bite into, and with a variety of toppings and sauces, there should be a pizza or salad for everyone. A single pizza should be enough to satisfy the average diner. Taking over the former space of Hubbub, Assembli fits in quite nicely with Cambie Street in Vancouver. The modern vibe of fresh custom pizzas matches the interior well with the inviting front windows and double height loft ceiling. Inside there's seating for about 30 guests among booths and tables. There's also this sweet mural depicting the Vancouver downtown skyline. At Assembli, you'll place and pay for your order prior to receiving it. For those in a rush, Assembli offers (limited) delivery and in-store pickup for their non-GMO, hormone-free, antibiotic-free pizzas. For this media tasting, the staff were welcoming and were keen on sharing their favourite custom pizzas and salads.